The politics of dancing have never been more deadly. After meeting with the Russian royalty, D’Eon and his comrades find themselves in the Empress’ favor. Yet she has partners who want to cut in, cut them out, and cut her throat. And as the tempo of this political waltz speeds up, darker and more dangerous missteps are made. Secret sorcerers show their true faces. Powerful players make desperate moves. D’Eon, at last, comes face-to-face with the traitor to his cause and, quite possibly, the one responsible for his sister Lia’s demise. There were still a few parts where I could have nodded off, but overall, I think each episode was fairly well balanced. The story is still moving awfully slow, but they did advance the plot a bit. D’eon and the others finally catch a glimpse of the Royal Psalms. And they look like… the DVD cover! I thought that was pretty sweet. I thought the villain was going to say something like “I have in my hands… volume 4! I know everything that will happen, and therefore, I can destroy you!” Kind of like that one scene in Spaceballs. According to my calculations, the amount of zombie stabbing/slashing counteracted the political drama by a ratio of 7:5, which is definitely an improvement. Hopefully the gang’s zombie fighting adventures don’t let up when they arrive in England for the next volume. Did I mention how sweet it was that the Royal Psalms look like the DVD cover? I think I did. This volume has a bunch of commentary tracks by the English VAs. They’re sorta gimmicky, like one is with the VAs who play the Russians, another is by the VAs who do the Poets… I’d still rather listen to the two boring girls talk about translation and period France. As with the last two volumes, there’s also a booklet with historical info, an interview with the Japanese VA of D’eon, and other stuff. Hey, I didn’t know D’eon’s voice was also Asakura Jun’ichi from Da Capo! Slowly, the mysteries behind the plot of Chevalier are beginning to surface. I’d say the plot is still going way too slowly, but at least it’s finally going somewhere. Plus, there’s a whole lot more zombies munching on people / zombies getting pwned by Le Chev. I think we can all stand behind that. 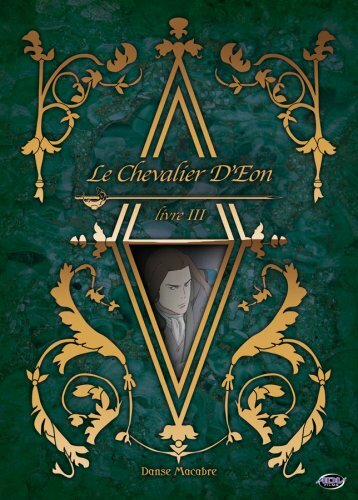 Many thanks to ADV for sending me a review copy of Le Chevalier d’Eon – Danse Macabre (Vol. 3)! Entirely appropriate for the Chevalier Robin. “Chevalier” in French is about the same as “Knight” in English. That leaves us with “Brave Sir Robin” as in Monty Python and the Holy Grail. A more appropriate role model than Batman’s sidekick, I’d say! I wish to show my appreciation to you just for bailing me out of such a predicament. Just after surfing around throughout the search engines and meeting strategies that were not beneficial, I figured my entire life was done. Living minus the answers to the problems you’ve sorted out by means of the blog post is a critical case, as well as the ones that might have adversely affected my entire career if I had not noticed your website. The training and kindness in playing with almost everything was important. I’m not sure what I would have done if I hadn’t encountered such a thing like this. I’m able to at this point look ahead to my future. Thanks a lot very much for the professional and amazing guide. I will not be reluctant to endorse your web sites to any person who needs and wants counselling on this subject matter. Whats up very cool blog!! Man .. Excellent .. Superb .. I will bookmark your web site and take the feeds also…I am happy to search out so many helpful information here within the publish, we’d like work out more techniques on this regard, thanks for sharing.